My first dip into outlaw status was unexpected. Earlier, the boys got in a massive (by our scales) battleship fight. I didn't go along. They owned all over it. 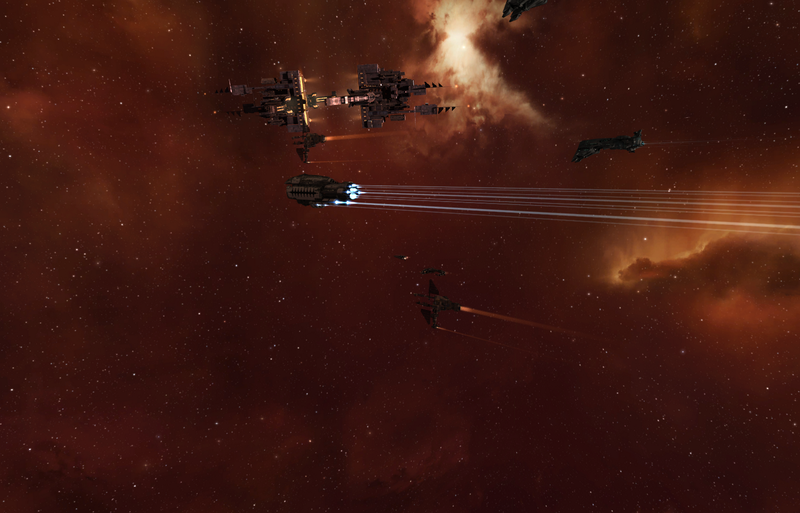 They managed to drag their intital eight battleships just jumping into the fight into a hot drop with triage carriers backing them up. They lost two out of fourteen. 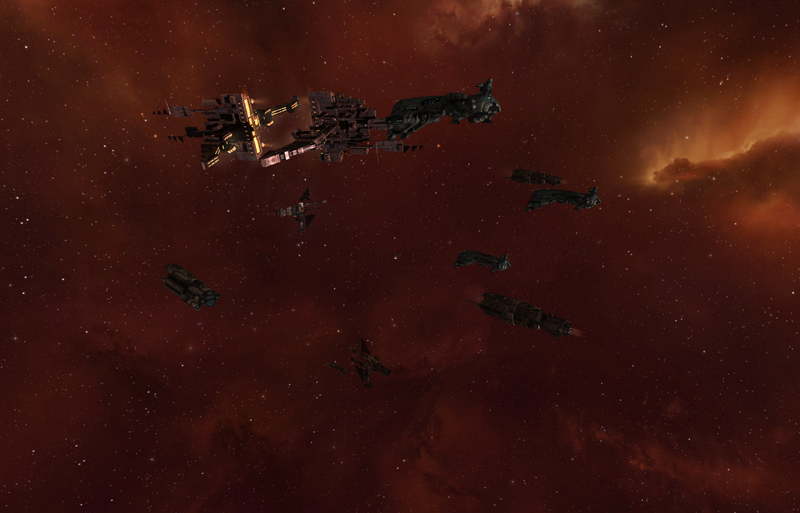 The other fleet lost 20 out of thirty one. They were all sorts of worked up after that. When everyone got settled back down we went looking for trouble. Space has been rather busy of late. It is a good thing. End of summer reactivation means more people. 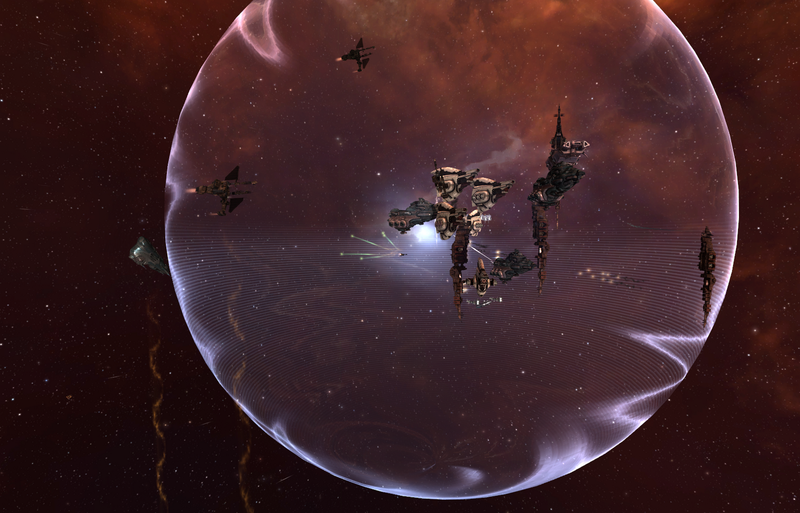 With all the chances to the game and shifting of null sec there is a lot of moving happening. Anyway, the boys found two members of a corp that can perhaps be called enemies. I doubt we will ever see more then eye to autocannon with this group. It was enough. Their proteus engaged our bait damnation. That led to the swift destruction of the proteus and his sleipnir friend that came to assist him. With that completed, there was a general run back to see if another fight could happen by the other bait ship. However, he was not able to get anything decently engaged. During the hot drop, a third party member said, "You hot dropped for that?" to which he was told, "We'd hot drop for just you to!" With nothing on the horizon there was a general decision to go and bash a POS they had been looking at. I downshiped to something faster and more tackle capable then my hurricane. The goal is to take out whomever comes to try to hot drop us before the drop happens. So we had a nice subcap fleet to support our capital ship fleet. This is the second time of late someone was manning the tower. Someone decided to try to reload the guns in a cheetah. The cheetah was popped and we managed to tackle the pod as well. Suspicion is that the pilot was quad boxing accounts. That slows the reflexes a bit. I popped his pod. I didn't think twice about it. The FC goes, "Sugar, grab that pod" and I said, "Already on it". It was a nice pod kill as well at 288mil. He had some nice implants in. I didn't think much about it until I checked my sec status when I noticed that I had GCC. Mentally, I expected it to be around -4.8 or -4.9. I forgot what a pod does to you. For anyone that would like to see what pod killing does to your sec status in low sec, here you go. I have a stack of sec gains from running exploration sites. It is a nice showing to see how small gains are and how huge hits are. Also, my sec hit was instantaneous but my sec gains have to wait on the 15 minute 'tick'. I will also note that not every ship I shoot is reflected under my security status log because shooting outlaws does not create sec hits or gains. Hello flashy red outlaw status. And the only lesson that I learned is that pods are often full of surprise goodness. It's sad to see that blobbing has become the norm even in lowsec. It used to be that you could get small gang fights, but now when you engage with 2 man it almost always means you get outnumbered 8 to 1. Even so called 1v1s are more often than not 1v2 or 3 (booster, falcon). It goes full circle for all sides. Sometimes we are out numbered. Sometimes we do the out numbering. Sometimes it is equal(ish).